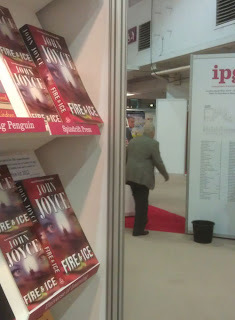 'Fire & Ice' - my new Cold War novel based around the Cuban Missile Crisis - was on display at the London Book Fair in Earl's Court last week. This is a truly massive book fair, which this year featured a great deal of interest from China and a very useful range of talks and seminars, as well as a wealth of networking opportunities. 'Fire & Ice' featured on the Independent Publisher's Guild (IPG) stand under the Spindrift Press banner and I'm very grateful to Bridget Shine and all the other members of the IPG team who made it possible. I was able to meet a number of useful contacts in the hard-copy book distribution and marketing area, as well as in the quickly growing e-book area. As a first-time visitor to the London Book Fair, I was blown away by the scale of it all (although those who've been to the Frankfurt Book Fair tell me that this even is SIX TIMES as big as the London Book Fair!!!). Even the 'rights area' upstairs, where agents meet clients to discuss the sale of overseas rights to books and where I met my own agent, seemed to feature an endless sea of tables in what looked like the biggest 'speed dating' agency in the world. 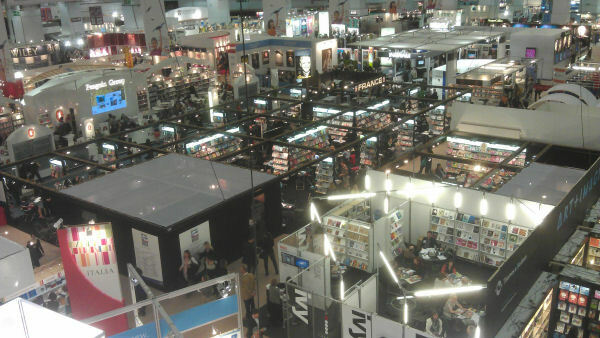 I would strongly recommend the London Book Fair as a fantastic introduction to the world of books for any author or publisher, but wear a pair of comfortable shoes and take a break every hour or so by going outside so that you're not completely overwhelmed by it all!